Perhaps you’re troubled by lingering sadness or hopelessness, or you’re noticing changes in sleeping or eating habits, a lack of energy, trouble concentrating or a loss of interest in activities you used to find pleasurable. These symptoms may indicate depression or a related illness. But how do you know for sure? Talking with a doctor about what’s bothering you is the most direct route to determining what’s wrong and taking action to remedy the problem. But for many people, the prospect of discussing a mental health problem with a doctor is almost as scary as the problem itself. This article contains 13 tips to help you prepare for the conversation, and for what comes next. Too often, patients are afraid of bringing up their mental health concerns. Sadly, despite great progress in the field, mental illness is still a subject branded by shame, misunderstanding and stigma. If you associate your symptoms with weakness or character flaws, it’s no wonder you hesitate to discuss them. That’s why the very first conversation you need to have is with yourself. Depression is a serious illness, with specific medical strategies for managing it. Read more about countering stigma, including your own, here. Tip #2: Choose which physician to confide in. For many patients, a primary care physician (PCP) provides regular care and coordinates the care delivered by specialists. PCPs may be general practitioners, family practitioners or internists. By whatever name, the PCP is in a good position to both assess your needs and work with you to develop a treatment plan. However, some patients may be in more regular contact and have a more familiar relationship with a specialist such as an obstetrician/gynecologist (OB/GYN), cardiologist or endocrinologist. These doctors are also qualified to hear and respond to your concerns. In some instances a patient may decide to schedule an appointment directly with a mental health specialist such as a psychiatrist. Regardless of which doctor you choose to discuss your concerns with, the sooner you reach out and start the conversation, the better. Tip #3: Set goals for the conversation. Before the discussion, think about the outcome you’re seeking. Remember that diagnosing and treating depression takes time and expertise, so if your goal is to make your symptoms disappear immediately, you’re likely to be disappointed. Instead, set a few reasonable goals for the conversation, such as a) putting your concerns on the table and b) working with your doctor to determine a plan to address those concerns. Tip #4: Do a little homework. Just by visiting this site, you’ve taken a big step toward preparing yourself for what lies ahead. Here, you can read about the most common symptoms of depression, anxiety, bipolar disorder and substance abuse, and about the established treatment approaches for each. You can sample some of the diagnostic tools healthcare providers use to diagnose these conditions. And you’ll even find a worksheet that, along with this article, can help you to organize your thoughts and anticipate questions that might arise during your conversation. Tip #5: Don’t expect the doctor to read your mind. Even a doctor who has seen the same patient for many years may miss the symptoms of mental illness, especially if he or she is focused on other conditions and concerns. That’s not to say that doctors never sense a problem and ask about it – in fact, they frequently do. As depression becomes a more commonly-discussed topic in primary care and family medicine (depression is now a diagnosis in one in ten office visits), more and more doctors regularly screen for it. But don’t assume it will come up – prepare to bring it up. Tip #6: Make it a top priority, not an afterthought. In a busy medical practice, your time with the doctor is limited. 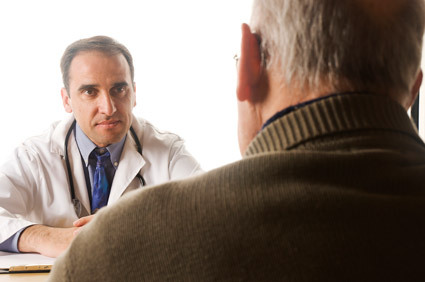 Many patients see their PCP for a brief visit once a year or less. The temptation is to stuff a number of issues into one meeting. When mental health issues fall to the end of the list and are shared at the very end of the appointment, little time is left for discussion, screening and treatment planning. Instead, express your mental health concerns and symptoms up front. Consider preparing a brief list or using the First Meeting with Your Provider worksheet on this site to guide the discussion. To allow enough time, you may need to schedule a separate appointment to address your other medical concerns. Tip #7: State your concerns as plainly as you can. If you describe your symptoms too vaguely, the doctor may look for physical causes, rather than honing in on emotional factors. Instead, use clear statements like “I think I might be depressed,” or “I am experiencing the following symptoms” to begin the conversation. The more direct and specific you can be, the easier it will be for your doctor to respond effectively. Tip #8: Understand that there are a number of diagnoses to consider. Once you’ve shared your concerns, realize that your doctor has the important and challenging job of arriving at a diagnosis. What may initially sound like depression may in fact be the result of more than one mental health issue, and/or a combination of mental and physical illnesses. For example, anxiety and depression often occur together, depression and bipolar illness share some common characteristics, and depressive illnesses frequently co-occur with chronic conditions like cardiovascular disease, diabetes or cancer. Your doctor may ask a number of screening questions and/or schedule a follow-up appointment to learn more. Tip #9: Manage your expectations. What do you expect will result from your discussion? Do you expect to leave with a prescription to fill? A referral to a specialist? Today, over half of all antidepressants are prescribed by primary care physicians, so if an initial diagnosis can be made, your doctor may start treatment right away. In addition to medication, he or she may encourage you to be seen by another mental health provider such as a psychologist or social worker to provide counseling or psychotherapy as part of a comprehensive treatment plan. Tip #10: Take ownership of the follow-up. Ideally, when a new diagnosis is made and a psychiatric medication is prescribed, a follow-up call or visit should be scheduled within one to two weeks. At this early stage in treatment, the doctor can confirm that the patient is taking the medication correctly, and assess whether he or she is seeing any improvement in symptoms or experiencing any side effects. But as recent studies of electronic medical records from across the nation reveal, doctors often schedule the first follow up appointment a month or more after the initial consult, missing the opportunity to intervene early in treatment. Timely follow-up is important to keeping you and your doctor on the same page. If your doctor doesn’t schedule a follow-up appointment shortly after you begin treatment, you need to do so. While it is asking a great deal of a patient to be proactive, especially when he or she is feeling down and vulnerable, the best outcomes result when patients play an active role in their treatment. You’ve already shown courage by sharing your concerns – build on that victory by continuing to “own” your diagnosis and treatment plan. Tip #11: Make sure your providers are communicating with each other. Just as you may need to take the lead in coordinating your follow-up, you may need to take steps to keep everyone participating in your care connected. It is common for the PCP to prescribe medications while therapy is provided by a psychologist, social worker or other specialist. To help facilitate communication between your providers, first make sure that you have signed a release form (sometimes called a HIPAA form because it is the product of the Health Insurance Portability and Accountability Act of 1996) so that your physician and therapist can exchange information while protecting your privacy. It is also helpful to have your therapist share his/her diagnostic assessment along with notes about the objectives of your therapy with your doctor. Tip #12: Be a persistent advocate for yourself. Your doctor is the best “first responder” for all of your health concerns – including those impacting your mental health, and should be both willing and able to tackle this challenge. But in the unlikely event that he or she does not act upon your concerns, don’t give up. If necessary, work with your health insurance provider to connect with other resources. Most health insurance providers offer an option for self-referral to a mental health provider. Regardless of where you receive care, be patient with yourself and with your care providers. Each case is unique, and it takes time to arrive at an effective individualized treatment plan. Finding the right approach to managing your symptoms may mean trying more than one medication or combination of medications as well as counseling and a mix of self-care strategies. Once you’ve begun the dialog, continue to speak up about what’s working and what isn’t. Remember: it’s a team effort, and you are the most important member of the team. Contributions to this article were made by Michael Klinkman, M.D., M.S., Professor of Family Medicine and member of the University of Michigan Depression Center.